Regular readers may have been wondering whether I ever cooked those beautiful purple scarlet runner beans, and if so, how they turned out. 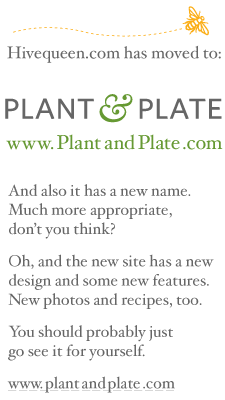 In fact, I made them only a few days after we picked the beans, but more important blog topics jumped to the head of the queue. Like bitching about the goddamn deer. Come to think of it, this recipe would probably be excellent with venison. Just, you know, in case one of those deer happens to accidentally fall onto some bullets. 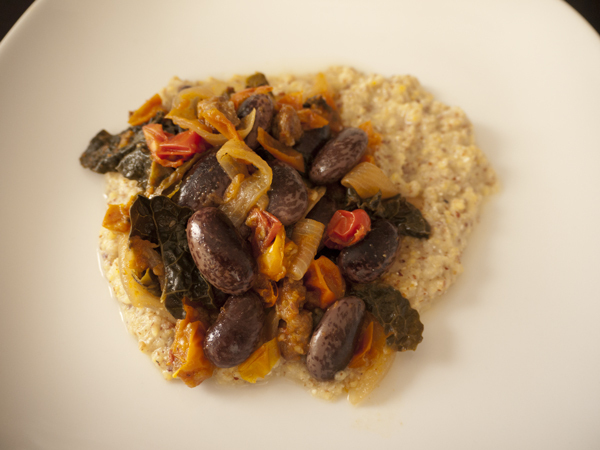 I used a lovely coarse-milled, whole-grain polenta from Community Grains. 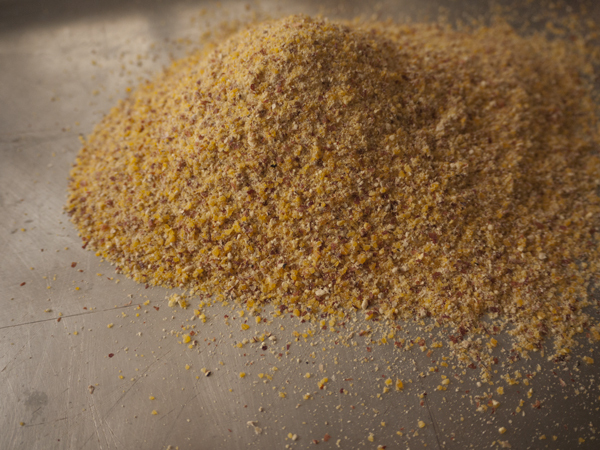 It's made from an Italian heritage variety of red flint field corn, grown organically in CA. It does take longer to cook than the other varieties I've used — something good to know before you get to the part of the recipe that tells you to cook the polenta for about 5 minutes. Whatever variety you're planning to use, check the instructions on the package for the water/grain ratio and cooking time, and plan accordingly. 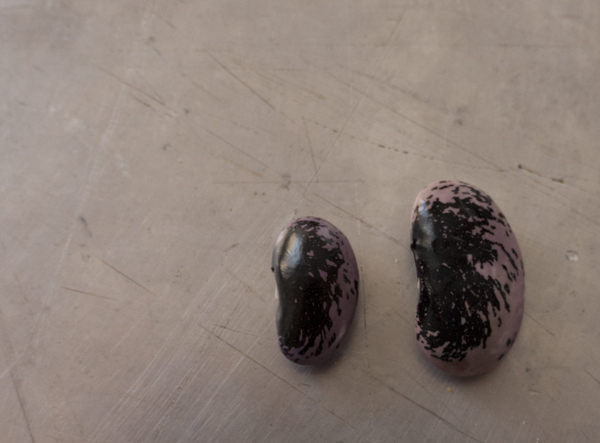 The bean on the left is dried, and the one on the right has been soaking for 5 hours. Another thing to plan for: soaking the dried beans. This isn't strictly necessary, but will cut down on cooking time. Different sources recommended soaking times from an hour up to overnight, and cooking times from 40 minutes to a few hours. I soaked these for about 5 or 6 hours, and they cooked in under an hour. 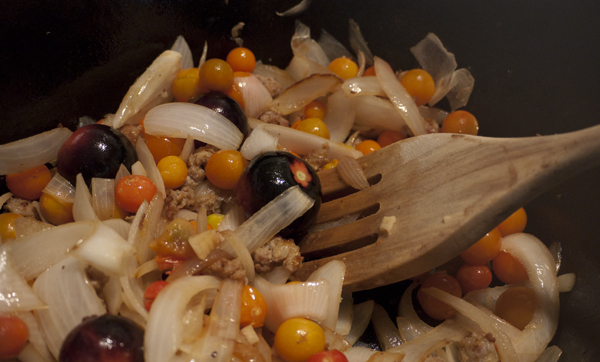 Why yes, those are black tomatoes. The variety is "Indigo Rose." 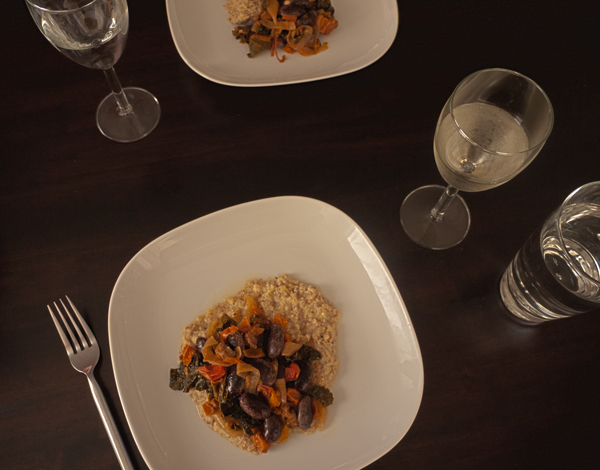 I generally followed Inverbrook Farms' recipe for "Runner beans in smoky tomato sauce over creamy polenta." I left out a few ingredients, swapped others, and changed amounts according to what I had in the fridge or pantry. My ingredient list is below. Since I wasn't sure how long the beans would take, I started them early, simmered them until they were tender, then drained and set them aside. When everything else was almost ready, I just stirred the beans into the tomato mixture to heat back up. Fortunately, they held their color and texture very nicely. I also started the polenta much earlier than the recipe calls for. 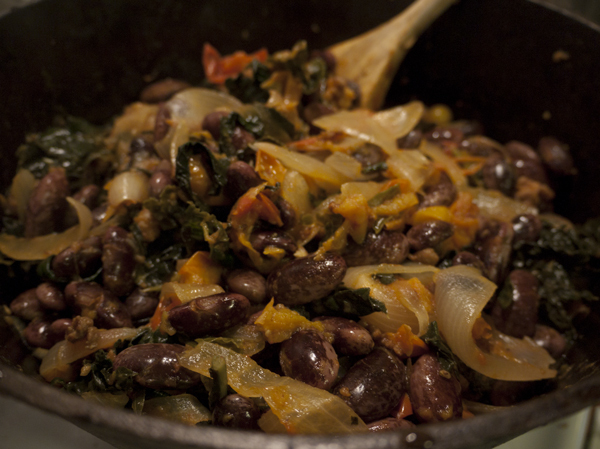 See http://inverbrook.blogspot.com/2012/09/scarlet-runner-beans-in-smoky-tomato.html for original recipe and directions.